One of the most common questions we get asked is ‘how much is my claim worth?’, we can fully understand you asking this question. 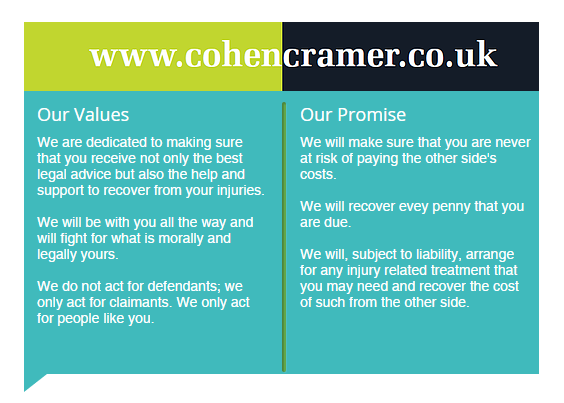 This is what your claim is all about; recovering for you the compensation that you deserve. The amount of compensation that you will receive for your injuries depends on the extent and duration of your injuries. If you suffer a basic strain or muscle tear injury that lasts for about 12 months you could expect to receive in the region of £1750-2250.00. If you break a bone in your arm you could look to receive anywhere between £4,250.00 and £12,250.00 depending on the extent of the injury and how well and how quickly you recovered. The figures given above are for physical injuries and for guidance only – they do not include financial losses such as lost income or treatment costs. We treat our Client’s as individuals and can only really give you an accurate valuation once we have a medical report giving a full assessment of your injuries and how they have affected you. We take care of getting the medical report; we take care of everything. Be wary of websites that give, what may seem, to be very high figures for the most simple and straightforward of injuries; they don’t have some super magic power that allows them to claim extra compensation. It is really just a con to get you to contact them and sign up to them. Until the full extent of your injury and how it has personally affected you is known then it will not be possible to give you a realistic valuation of your claim – we believe in giving advice not estimates. incidental costs arising from your accident such as taxis fares, additional mileage etc. Your claim can be dealt with on a ‘No Win – No Fee’ basis, this means that if for any reason you are not successful then you don’t pay us a penny for the work we have done.